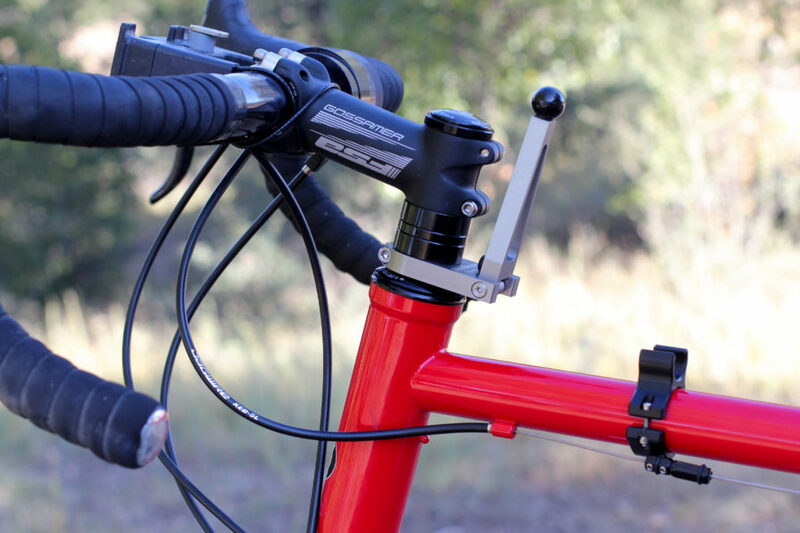 The SteerStopper - It's a Parking Brake for Your Bicycle! What Exactly is the SteerStopper? The SteerStopper is a new, independently produced bicycle accessory designed by Tom Melcher of Sacramento, California, who set out to solve the ongoing issue every cyclist has encountered at one point or another – the problem of having your bicycle tilt, slide or completely fall over whenever its placed in a leaned or parked position. You go for a bike ride and pull over on the side of the road to take a photo, eat a snack, drink some water, go to the bathroom or simply give your backside a break from the saddle. Thinking ahead, like every good cyclist should do, you make sure to stop in an area where there’s a stop sign you can lean your bicycle against during your short break. You get off your bike, lean it up against the pole of the stop sign, quickly check to make sure the bike is balanced in such a way that it won’t fall over when you let go, and then you walk away. Seconds later, you turn your back, the wind blows, or your front wheel turns and there’s suddenly a loud crash! Your bicycle has fallen over – slamming to the ground in a sad metal heap. It’s at this point that you run over to your bicycle, pick it up, check for any potential damage, lean the bike back up against that same stop sign and hope that this time around you can position the bike in such a way that it won’t fall over again. 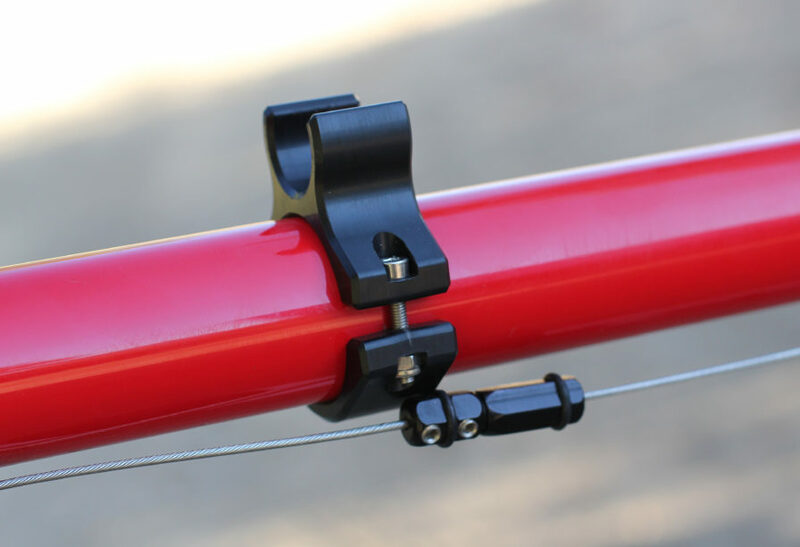 Whenever you go to lean your bike up against a wall, tree, fence or sign post, you simply lock the SteerStopper in position by lowering its 4-inch-long aluminum arm down into the small metal receiver mounted on your bicycle’s top tube. With the front wheel, front fork and handlebars now in a locked position, there’s no way for your bicycle’s front wheel to twist, turn or fall on its side. When you’re ready to ride again, simply un-clip the SteerStopper‘s retractable arm from the receiver mounted to your bicycle’s top tube and you’re free to continue on your way! The SteerStopper is a very simple bicycle accessory. It performs a very basic task and it solves many of the problems one might encounter with parking a bicycle in a variety of positions and scenarios. The best way to understand what the SteerStopper is and how it works is to watch the short video below. NOTE: This product was sent to Bicycle Touring Pro for free for the purpose of this review. As the Bicycle Touring Pro, I get sent all kinds of cycling products to test and review, but I rarely receive a product as unique as the SteerStopper. When I first heard about the SteerStopper and the problem it attempts to solve, I was skeptical. I wasn’t sure if this was a product that solved a real-world problem, or if it was a product in search of a problem to be solved. Regardless of how I felt about the SteerStopper at the time, I committed to using it on my bicycle for three full months. I installed the SteerStopper on my high-end Co-Motion Cycles Siskiyou touring bicycle, tested it on every single one of my bike rides and am reviewing it for you now after having used it on my bike for more than 90 consecutive days. Installing the SteerStopper is a piece of cake. The product comes with detailed installation instructions, but let me attempt to explain the installation process in my own words. First of all, you need to remove the headset stack from the top of your front fork. Use an Allen wrench to undo the bolt at the top of your steer tube, remove your handlebars and then remove the numerous spacer rings that you find here. Once you’ve removed everything, position the larger round end of the SteerStopper over the top of your bicycle’s steer tube and move it down to the bottom – tightening the pinch bolt so the arm of the SteerStopper is pointed directly back toward your seat post. It’s important to note that the SteerStopper is going to take the place of one of the your 10mm spacer rings you normally have mounted here, so remove one of the 10mm rings from your headset stack and then remount everything the way you had it before, with the spacer rings and handlebars in the exact same position they were previously. Then, tighten down the top of your headset, fasten your handlebars in position and move on to installing the second part of the SteerStopper – its receiver. The receiver is a small steel clasp or clip that you are going to mount to the top tube of your bicycle. Extend the aluminum arm of the SteerStopper down toward the top tube and then position your receiver in the area where the black metal ball meets your frame. You want to make sure you install the receiver so that when that ball comes down and snaps into place, the ball lands perfectly in the center of the receiver. The SteerStopper comes with a small band of double-sided tape, which is meant to be used when installing the receiver. Wrap the tape around your top tube where you wish to position the receiver and then place the receiver on top of the tape and fix it into position with the use of an Allen wrench. I decided to install the receiver without the included tape because I was fearful that the tape would ruin the paint job on my bicycle, but I was informed that the tape would not cause any damage to the paint job on my bicycle and that the tape is only meant to further prevent the receiver from sliding around on the top tube. If you need to adjust the placement of the arm/receiver for whatever reason, it’s good to know that the black ball on the end of the SteerStopper arm is adjustable. Simply twist the ball and position it however it will fit best on your particular bicycle. This adjustable ball will extend the length of the SteerStopper arm by approximately 1 cm. After you have the SteerStopper arm mounted to your steer tube and the black ball from the SteerStopper arm snaps into position directly in the middle of the receiver fitted on your top tube, you’ve completed the installation process! Total installation time = approximately 15 minutes or less. If you need help installing the SteerStopper, any local bike shop can perform the installation for you. However, there is no need to have a bike shop perform the install unless you are very inexperienced with bicycle headsets and how to remove them. If you are unsure how to perform this part of the installation process yourself, consider finding a friend who is knowledgeable about bicycles. This is a very easy install and almost anyone can do it! 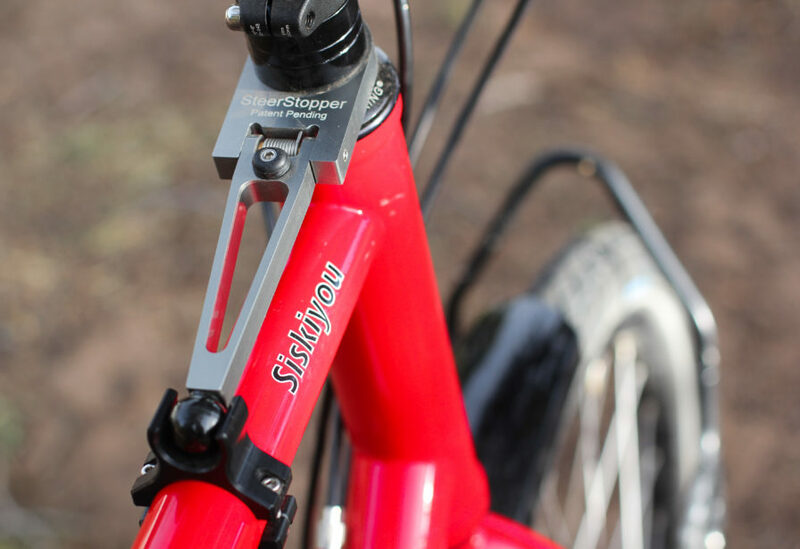 The SteerStopper also comes with two different types of brake holders, which can be used in conjunction with the SteerStopper to keep your bicycle from rolling when it’s parked on uneven terrain. There’s a para-cord style brake holder with a quick release (wheel lock) and a bungie cord style brake holder as well. I rarely used either braking device, so I’m not going to bother reviewing said accessories in this review. It’s important to note, however, that these products can be used in conjunction with the SteerStopper to make your bicycle even more secure when it’s placed in a parked or stationary position. Watch my SteerStopper product review video for a detailed demonstration of how to install the SteerStopper on your bicycle. 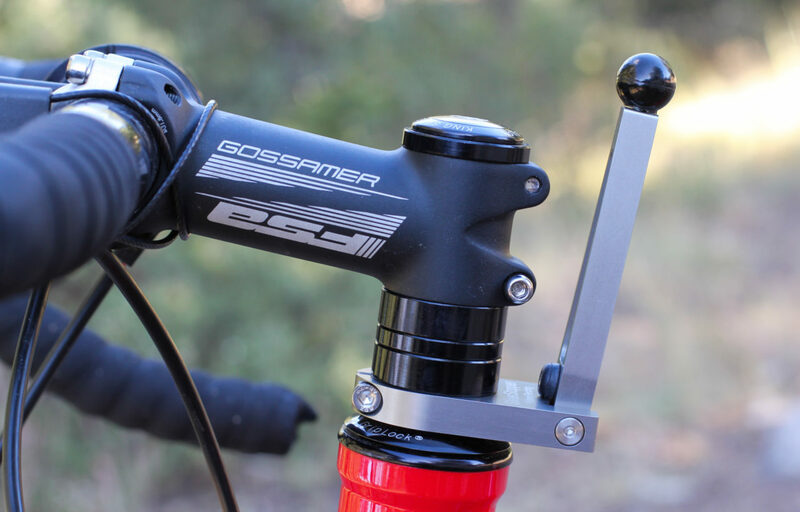 After I had the SteerStopper installed on my bicycle, I took off on a short 2-day bike tour in the mountains of Prescott, Arizona to test the product on the road. I wasn’t sure how often I’d actually use the SteerStopper on my travels. I figured it might be the sort of thing I only use two or three times per day, but boy was I wrong! The most difficult part of using the SteerStopper on your cycling exploits is simply getting into the habit of using it in this first place. Based on my experience with the product, this acclimation process takes about 3-5 days of heavy use. Because you’ve likely ridden a bicycle for your entire life without locking your handlebars, front fork and front wheel in position, you might have some trouble reminding yourself to lock the SteerStopper in place during your first several days of using it. However, as the days go on, you will quickly discover how handy the SteerStopper is to have in a number of different scenarios. Personally, I like to take a lot of photos when I’m riding my bicycle and I’m constantly stopping, pulling out my camera and taking photos directly from the bike. When I do this, however, I usually have to balance the bike between my legs, making sure that the front wheel doesn’t suddenly pitch to one side or the other and bring the rest of the bike crashing down with it. With the SteerStopper installed on my bicycle, however, these short photo breaks suddenly became a whole lot easier! Every time I wanted to stop and take a photo, I would simply bring the bicycle to a stop, swing the arm of the SteerStopper down into position and then I was free to take my photo without any worry of the bike falling over. And, of course, when I finished snapping my photo, I simply unlocked the SteerStopper arm from the receiver and continued down the road. Sometimes, I don’t just want to make a quick pit stop. Sometimes I want to get off my bicycle entirely and this is where the SteerStopper really comes in handy! As with the stop sign scenario above, the SteerStopper makes parking your bicycle a whole lot easier – no matter whether you are parking it against a pole, street sign, fence, wall or other such object. The trick is, you need SOMETHING to lean the bicycle against, as the SteerStopper does not keep your bicycle in an upright position by itself (like a kickstand or a Clickstand is designed to do). I found that parking my bicycle in camp, in my garage or at a hotel at the end of the day was made significantly easier with the use of the SteerStopper. With the product in its locked position, I could rest assured that a slight breeze or even a decent bump from a passerby was not going to suddenly unbalance my bicycle and cause it to go crashing to the floor. The scenario in which I found the SteerStopper most useful came when I went to lift my bicycle onto the roof rack that’s mounted on the top of my car. Normally, this is a pretty difficult task, as I need to hold the rear end and the front fork or front wheel of the bicycle in position so that the front wheel doesn’t tilt, hit me in the face or cause me to lose balance entirely. But with the SteerStopper, I’m able to simply lock the front wheel in position and then easily lift the entire bike up onto the roof rack in one foul swoop. I’m not at all exaggerating when I say that this has made the task of loading and unloading my bicycle from the roof of my car a whole lot easier! Finally, it’s worth mentioning that while balancing a bicycle up against a pole, fence, wall or sign might not sound that difficult with a regular unloaded bicycle, this delicate balancing act becomes a whole lot more difficult when you’re dealing with a loaded touring bicycle, a bicycle fitted with a set of front panniers or even a bike using a heavy handlebar bag. The more weight you have on the front of your bicycle, the more valuable the SteerStopper becomes, because all that weight on the front of your bike causes the handlebars, fork and front wheel to drift to one side or the other (depending on how you have your gear packed). This means that loaded bicycle tourists are going to have a more difficult time parking their bicycles and keeping them balanced when in a parked position. With the SteerStopper, however, balancing even a heavy load is literally a snap. Just lock your SteerStopper in position each and every time you go to park your bicycle and you won’t have to worry about your loaded touring bicycle falling over and causing damage to your bike, panniers or any other belongings you might be carrying with you. As you can see, there are a number of different situations in which the SteerStopper comes in handy. After I got in the habit of using the SteerStopper each and every time I went to park my bicycle, I was amazed at how nice it was have my front wheel locked in position. It seems like such a little thing, but locking my wheel in place made my time on the road noticeably easier as I was no longer having to perform that delicate balancing act each and every time I went to park my bike! The SteerStopper is incredibly well-made. With German-like engineering, the SteerStopper is not a cheap, plastic bicycle accessory that is going to break after a day or two of heavy use. This product is very well made, CNC machined and meant to last a lifetime! Installing the SteerStopper is easy. It only takes about 15 minutes. Anyone with even a basic knowledge of how bicycles work can get this product installed in a matter of minutes. The SteerStopper does the job it was designed to do. While it’s technically a “bicycle stabilzer” that can be used in conjunction with a brake application device, I like to think of the SteerStopper as a kind of parking brake for your bicycle. It keeps your bike from falling over when it’s parked, and it’s useful in a number of different scenarios as well (such as lifting your bicycle onto the roof of your car or up onto a garage bike rack, etc). I think the SteerStopper could also be used as a sort of secondary theft preventative. You’re still going to want to lock up your bicycle when you leave it unattended, but locking your front wheel and handlebars in place with the SteerStopper could prevent a potential thief from simply jumping on your bike and riding away. Because the SteerStopper prevents your bicycle from falling over, it also works to protect your bicycle from chipped paint, damage to your derailleurs or any other belongings you might be carrying with you on your bike. Finally, because the SteerStopper is installed as a part of your bicycle’s headset and is right in front of you as you cycle, there’s no need to bend over, lean back or twist uncomfortably to park your bicycle safely. Simply reach down and lock the SteerStopper arm into the receiver each and every time you want to lock your bicycle’s front wheel in position. Then, when you’re ready to ride again, unlock the arm and continue on your way. It’s seriously a piece of cake! While I was surprised at just how useful the SteerStopper was on my own cycling adventures, there are some drawbacks to this particular product. The main problem with the SteerStopper is that it’s not meant to be used (like a kickstand) to keep your bicycle balanced and upright without the use of something to lean the bike against. If you’re traveling through the desert, for example, and you want to keep your bicycle upright when you come to a stop, you would need to use the SteerStopper in conjunction with a traditional kickstand or a product like the Clickstand. It is not a fix-all for every situation in which you might want to park your bike. Secondly, the SteerStopper is not a one-size fits all product. When you order your SteerStopper, you need to make sure you get the right size product for your bicycle. This requires some measuring and/or research on your part before you even place your order. You need to figure out the size of your steer tube and then be sure to order the SteerStopper in its corresponding size. At this point in time, the SteerStopper fits 1″ and 1-1/8” threadless steer tubes (which is what you will find on most modern bicycles) as well as Quill stems with the use of spacers. 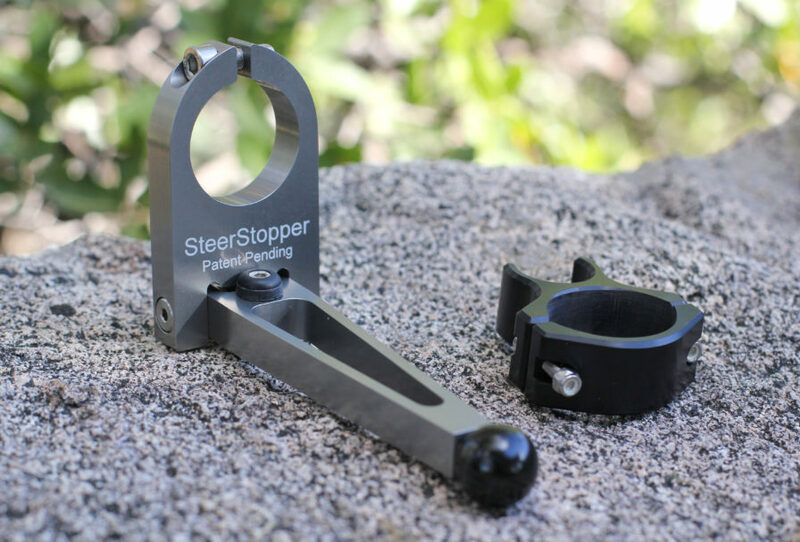 While the arm of the SteerStopper will fit on almost any type or size of bicycle, the receiver, which the ball on the SteerStopper arm locks into, will only work with round top tubes measuring 1-1/8”, 1-1/4” or 1-1/2”. This means that if you’re trying to mount the SteerStopper on a bicycle with an irregularly-shaped top tube (like you see on many aluminum bicycles and/or mountain bikes), the SteerStopper may be impossible to install. If you have a number of different bicycles that you ride, you might be wondering if it’s possible to quickly and easily move the SteerStopper from one bicycle to another. While it is possible for this to be done (so long as your bicycles have the same steer tube diameter), it’s not a simple task to move the SteerStopper from one bike to another. You’re probably going to want a SteerStopper for each of your bicycles! With the SteerStopper in its locked position, you will be unable to steer your bicycle, so be sure to disengage the SteerStopper before you begin cycling. I made this mistake a couple times in the beginning and found myself crashing to the ground after only a few revolutions of my tire. Learn from my mistake and don’t forget to disengage the SteerStopper before you begin cycling again! Finally, while the SteerStopper is incredibly well-manufactured, some people may not like the way it changes the overall style/design of their bicycle. Unlike a kickstand which is hidden away at the bottom of your bicycle, the SteerStopper is located right at the front of your bike and is very visible. Personally, I wish that the product itself were smaller, less intrusive or possibly invisible. As unique as the SteerStopper appears to be, there have been similar products sold in the past and there are similar bicycle accessories on the market today (These products are often times referred to as “steering stabilizers”). While some of these SteerStopper competitors have gone out of business, others continue to market and sell their wares, which likely means there may be an audience for a product such as this. I was skeptical about the SteerStopper at first. I wasn’t sure if it was something I would actually use, but ultimately, I was surprised at just how handy it became on each and every one of my bicycle outings. Parking my bike is a breeze… and the fact that I can now lift my bicycle onto my car’s roof rack with ease is by far the biggest benefit I’ve received from the SteerStopper! Overall, I like the SteerStopper because I enjoy not having to balance my bicycle or think about my expensive bike and gear falling on its side and getting damaged each and every time I go to park my bike. My biggest complaint, however, is simply how the SteerStopper looks when it’s not being used – as it’s mounted in such a prominent position on the front of my bicycle. If the product were smaller (or better yet, invisible – like something that was built directly into my steer tube/headset), it’s something I’d be installing on each and every one of my bicycles. Ultimately, I realize that some people who learn about the SteerStopper (even after reading my review and seeing how it works) will think the product is unnecessary and/or useless. But I also know there is a certain percentage of the cycling population who will find the SteerStopper an essential piece of their bike riding experience. Do you think the SteerStopper is simply a product in search of a problem? Or is the SteerStopper the solution to a problem you’ve been trying to solve for many, many years? Do you like the way the product looks? Or am I being overcritical of the way the SteerStopper changes the look of my bicycle? Will you purchase a SteerStopper for yourself? If so, why do you want to get it? And if not, what is preventing you from pulling the trigger? Leave a comment below and let me know what you think of the SteerStopper. This entry was posted in Bicycle Touring Pro Articles, Featured Articles, Main Articles, Main Featured Articles, Podcast, Product & Service Reviews, Uncategorized, Videos and tagged bicycle brake, bicycle parking brake, bicycle stabilizer, how to park your bicycle, parking brake, parking brake for your bicycle, review of the steerstopper, stabilizer, steer stopper, steering stablizer, steerstopper, steerstopper review, the steer stopper, the steerstopper, what is the steerstopper. Send a photo of your bicycle in this area. I may be able to offer you a solution. I do like this product and understand its benefits for a loaded bicycle … i saw it about a year ago but decided against it due to its high price [+$100]. If the price could be reduced to the cost of a good kick stand, i would strongly consider purchasing it. David- Maybe the BikrBar would be an option for you. $14.99. When you come to a stop and stay straddled on the bike on a slight up hill and thus the bike slow rolls back downhill, does the SteerStopper hit your crotch or lower belly? If so, does/can it hurt? I definitely want one!! I’m using another “stabilizer” right now, but it’s cheaply made, and when my front basket is heavily loaded the front wheel turns (because the spring is too weak!) as if I had no stabilizer at all! Thank you for your excellent review of the SteerStopper!! I have one on my touring bike. I LOVE it. I use a strap of about twelve to fourteen inches long with a Velcro patch at the end. I wrap it around the downtube and the front rim between spokes. While I think it is just as effective as the Steerstopper, I must admit that I have lost or misplaced a few straps. It would be hard to lose a Steerstopper, but straps are cheap and easy to replace at a hardware store. Still, I applaud the innovation and the design. I have a feeling that in a few product generations, it may well be improved to where it becomes standard equipment on new bikes. Hi Darren, I just ordered 3 Steerstoppers yesterday from Thomas (Tom) Melcher. One for my bike, another for my girlfriend’s bike and the third for my biketouring partner. I have been waiting for this kind of equipment for 30 years! Parking my hiking bike with 5 panniers will be easier now. I will try it next May for a 2 week trip to southern Quebec (Canada). As you said in your text above, when you stop without getting off your bike, to take a photo or binocular observation, you will not have to worry about the wheel turning. We call this: “Fuc… Jack-Nife” !! In addition, I use a kickstand with two legs. With this type of kickstand, the front wheel floats above the ground and can suddenly rotates completely. The steerstopper will be very useful with kickstand. I received a very good service when I contacted Thomas by email to inquire about sizing. We exchanged several pictures of my girlfriend’s bike because the speed cable pass under the top tube and has a spacer stack directly where the “receiver” goes. No problem, Tom sent us an extension to be able to move the “receiver” backwards. So I am clearly a “happy person kind ” ! I use mine multiple times daily for parking–to a tree, against a wall, or in a rack. No matter what the parking situation, the bike cannot flop and fall. 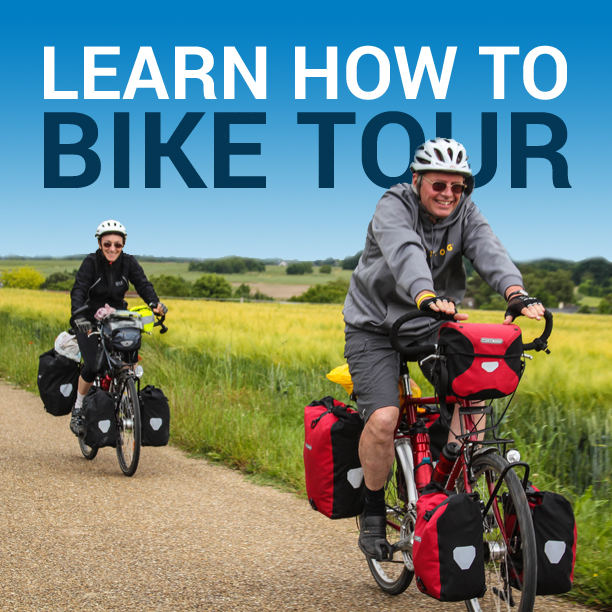 It’s essential when traveling, especially with front panniers, and you want to stop while straddling the bike, get the camera out of the handlebar bag, and snap a quick pic without risk of the wheel flopping and the bike scraping your let, etc. On a hill? Use the included brake actuators and the bike won’t roll, either! Disclosure: My brother invented SteerStopper, but my review is totally sincere. You will not regret having gotten yours! I’m touring on a bike with 4 full panniers and a heavy BOB trailer. Darrian has seen my rig and will attest to how cumbersome it is. Without the SteerStopper it would be impossible to load & park. To me and my situation, it’s a blessing. Hello Darren-this is not a new idea. There was the Rhodes Gear Flickstand 30(yrs?)back. That was lighter and easier to install. Likely not as durable as this. If you are not aware, it was a wire bail that one flicked down from the down tube and locked the front tire. I like the idea and used a device in the past that pressed against the front tire to hold the steering straight forward while parked. Cannot find the right item now that I ride a Bike Friday Pocket Llama …but still looking! This design is good, but not adaptable to ALL bikes, yet. I was glad to see the spring that keeps the lever in the up position when riding. Would not want it to fall down and lock while rolling. But then maybe on 20 mile straight roads in Australia riding hands free ?? I use a hook and loop (Velcro) strap. I love my SteerStopper! It is a game changer as far as I am concerned. It makes parking and pushing our loaded tandem so much easier and totally eliminates the worry of the bike falling over! It is easy to engage and disengage, which encourages its use. One nice additional benefit is that it retains your steering bearing preload when you adjusting your stem height. Truly an innovative product that beats the dickens out of several previous devises going back 40 or more years! I must agree with several riders regarding the VERY HIGH PRICE. Nonetheless I’ve plunked down the dollars and will have it om my new Touring bike as soon as it arrives. Leaving for the Yucatan around the 20th of August then on south to either Nicaragua or Panama. Home for Christmas. This product review is one of the best I have read. I’m very pleased with this product. Wish I had purchased it sooner when I first learned about it through The Adventure Cycling Association. I’ve been using it almost daily on my commuter and have not had any problems with it. Build quality is fine and durability also. I suppose a person could drill a hole through the head tube and steering tube then install a pin and achieve similar results. My solution is cheaper (free) and lighter (2 grams?). It stops the front wheel from rotating but does not stop the fork from turning. For me, simply stopping the wheel from rotating prevents the bike from falling over in most cases. What is my solution? Take an old inner tube, cut about a 1/4″ length of the tube – making a small but wide rubber band, and slip that over the end of the handlebar where your front brake lever is mounted. When you want to park your bike, pull a bit of the rubber band over the brake lever (you will have to squeeze the lever to get it close enough to the bar to allow the band to stretch over it). This doesn’t help in Darren’s example (of mounting your bike on a car top rack), but it does prevent most fall-over causes and does act as a theft deterrent for grab-and-ride thieves. It also doesn’t interfere with top tube bags, which apparently the Steerstopper would. But you do have to remember to remove the band from your brake lever when you’re ready to ride! Wish they would sell it as a stand alone product.